redxmaverick (3 jaar geleden) #3104406That much is obvious. I just want to see her in a different outfit. She wears the traditional blue outfit in SF4 too. This figure can pass as SF4 as well. 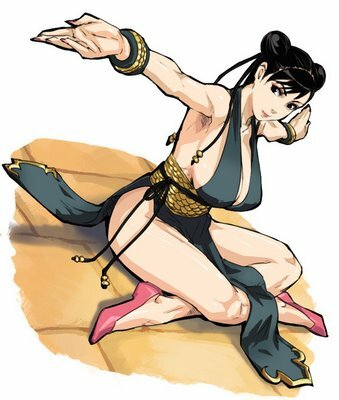 Weeeell... SF3 is really the only game they portrayed her being super lean (long, thin neck and arms). She's pretty meaty in almost every other game iteration. So I would say this is definitively SF3 (and any real SF fan would recognize this immediately, I'm sure). Funny ho the paint job in these particular images tuned out better than the one from the actual finished product. Anyone knows where I can get this GK? Any idea where one can find the backdrop and base they used here? I doubt the Embrace Japan version will come with it. Naota (3 jaar geleden) #3104261That's from street fighter 4, not 3. That much is obvious. I just want to see her in a different outfit. She wears the traditional blue outfit in SF4 too. This figure can pass as SF4 as well. redxmaverick (4 jaar geleden) #2965233Great news! I really hope they do a variant of her in the black chinese dress. That's from street fighter 4, not 3. DCJP (4 jaar geleden) #2907609She's going into production by Embrace Japan! She's going into production by Embrace Japan! I really liked that crouch animation pose from 3S. How can i purchase this? Anybody knows? street fighter iii 3rd strike: fight for the future?